The 30.2 metre sailing yacht I-Sea, listed for sale by Aqua Marina Yachts in Israel, has been sold with the buyer introduced by Simon Turner at Northrop & Johnson. Built by South African yard Southern Wind to RINA class, she was designed by Farr Yacht Design with an interior by Nauta Design and delivered in 2009 as one of the successful series of SWS 100DS advanced composite yachts. MCA compliant, she has an exceptionally voluminous four cabin interior layout for eight guests in two doubles and two twins, all en suite, with crew areas for five crew aft. Her deck saloon configuration offers a protected guest cockpit and a large deck house with panoramic coach roof windows giving wide views of the sea. The 6.7 metre beam of the saloon allows for a comfortable U-shaped sofa on the port side and a large dining area for up to 10 guests to starboard. Interior styling is both elegant and functional, with all furnishings built in honeycomb sandwich veneered with natural, open grain teak. The interior is further enhanced by linen coverings on seating, cushions and the bulkheads. Having had only one owner since new, I-Sea has been impeccably maintained and recently had her rigging upgraded. 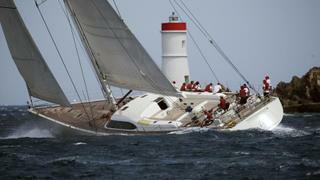 She also benefits from a new set of cruising sails and an almost unused set of racing sails.